Reminiscent of lunch boxes of the past! 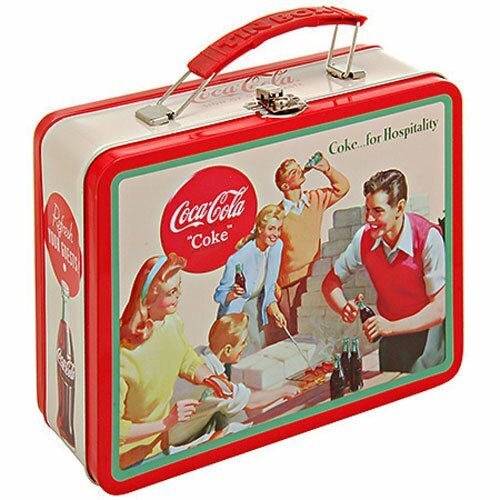 Carry your lunch in style... in an old fashioned Coca-Cola lunchbox made of galvanized tin with full color Coke for Hospitality logo with kids enjoying refreshing bottles of Coke from 1950s advertising. This embossed tin lunch box is a big 7.5" x 6" x 2.75" in size with a flexible black handle. Can also be used for plants, decorating, desk organization, and of course, lunches! New in original packaging made by Tin Box Company.